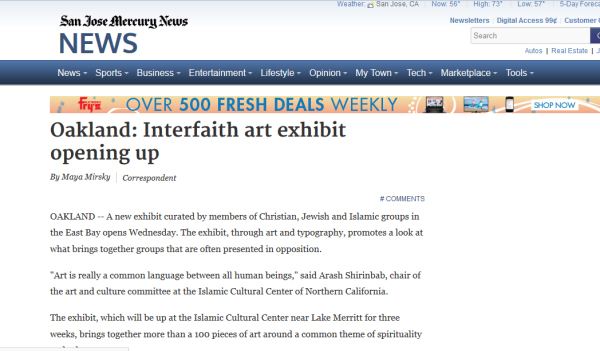 April 17, 2013--Oakland, CA: On Saturday, May 11, from 5 to 8 pm at the Islamic Cultural Center of Northern California (ICCNC), the interfaith art exhibition “Finding Common Ground through Sacred Words” will open with a public reception. 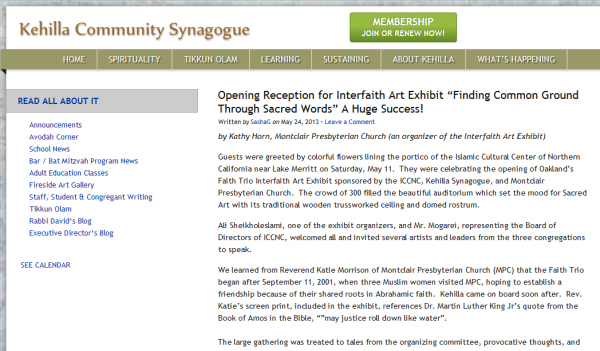 ICCNC is one of three congregations that, along with Kehilla Community Synagogue and Montclair Presbyterian Church, make up the ‘Faith Trio,’ an interfaith initiative that has coordinated this exhibition, and has collaborated on a variety of community-building activities over the past eleven years, since the events of 9/11. The artistic focus is on sacred text, with 130 works of art on display including calligraphy, needlework, paintings on silk, oil paintings, watercolor, photography, quilts, stained glass, sculpture, clay, digital art, and paper collage. Each work somehow incorporates words, text or letters in unique expressions that underscore interfaith understanding, spirituality, peace and cultural dialogue. Artwork has been submitted to the exhibition that incorporates writing in English, Hebrew, Greek, Arabic, Runes, Farsi, Korean, Chinese, and more. At the opening reception on Saturday, May 11 (5 - 8 pm at ICCNC in Oakland) attendees can view the artwork and meet the artists, and representatives and faith leaders of the Faith Trio and other congregations. Refreshments will be served, and the reception is open to all and is free of charge. The exhibition opens May 11th and closes on June 7th, and is open for viewing on Wednesdays 10 am - 4 pm and Saturdays 10 am - 4 pm. This exhibition was funded in part with support from the San Francisco Foundation’s FAITHS fund, the Alliance of California Traditional Arts (ACTA) and East Bay Community Foundation. 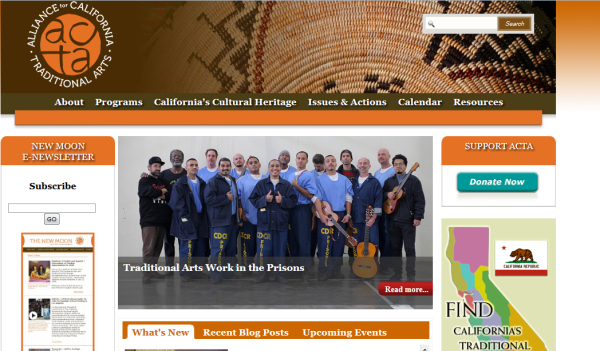 “Finding Common Ground through Sacred Words”, by Lily Kharrazi, on Alliance for California Traditional Arts website. 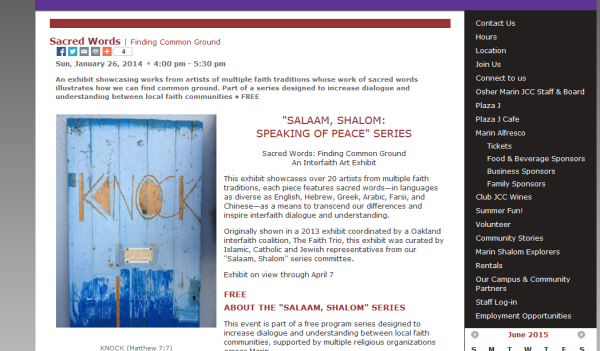 “Sacred Words, Finding Common Ground”, on Marin JCC Website.